There’s more than one way to go on vacation. Box Elder, SD – Rather than pay exorbitant airfare prices for seats that are getting smaller by the day, one South Dakota man had a creative and relatively inexpensive way of getting himself to Puerto Vallarta. 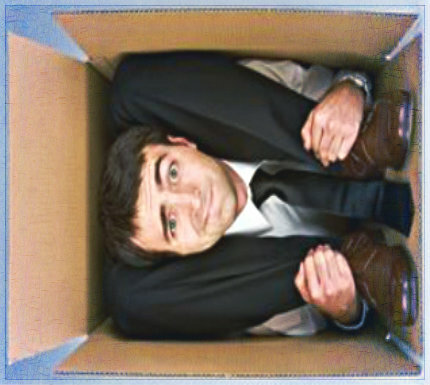 Declan Morgans decided it would be ten times cheaper to mail himself to Mexico in a cardboard box rather than pay some airline to box him into tight seating not unlike sardines in a can. Once he arrived at his destination and became unboxed, Declan simply did a few stretches and then headed to the nearest margarita for some automatic attitude adjustment. Statistics show that more and more people are either mailing themselves or their kids and pets to destinations heretofore only traveled to by conventional modes of transportation. What do you think about this? Would you travel in a cardboard box to distant lands? Do you think airlines passenger seats are becoming too small and too densely packed together? Does a margarita sound real good to you right about now?